All fluorescent and HID lamps lose output with age; some more than others, especially covered and reflector CFLs. 10% after 1000 hours for bare tubes and more and as they age, is considered normal in the lighting industry. Though the general public is usually not informed of this fact and will end up with less light than they thought they were buying if they follow the recommended conversion charts. And these are some of the best CFLs on the market. Lower end lamps can be expected to lose even more. Update Dec 2009: Finally, some journalists are starting to actually read consumer and governmental tests instead of just mindlessly trusting the inflated propaganda from EU, Energy Star and Energy Saving Trust. Just as I’ve been saying. Every lighting professional knows this and plans for it. And you don’t even have to check consumer tests: it’s right there in manufacturer catalogues (if you know what you’re looking for) and manufacturers won’t deny it if asked; they’re just not going to volunteer that information to the public if you don’t ask. Update July 2012: There seems to have been some slight improvement in some of the best bulbs according to the latest Swedish consumer tests, but still ‘stick’ type CFLs lost a mean of 16-24% (= mean 15%) after 5 000 hours, ‘spiral’ models 18-21% (mean 14%), and ‘bulb’ models as much as 15-30% (mean 23%). And this is under controlled lab conditions where lamps won’t overheat or get switched on-and-off more often than the recommended 15 minutes minimal burning time, as they might during home use. Compare that to a mean of just 6% light loss in incandescent lamps, according to earlier tests – which won’t even be noticeable as they will get replaced sooner, whereas CFLs will just keep getting dimmer and dimmer with age. 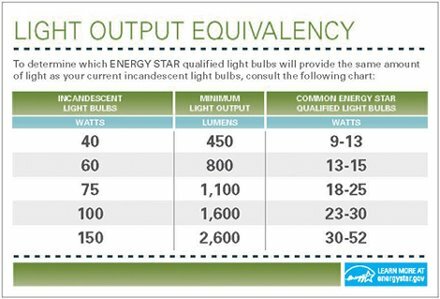 If a typical CFL does not produce as many initial lumens as the lamp it is supposed to be replacing, it cannot possibly be said to give “5 times more light” of incandescent energy use. This is consumer fraud, first accepted and perpetuated by utilities and state authorities, and now by EU! As explained in under Life Span, CFL output degrades with age. 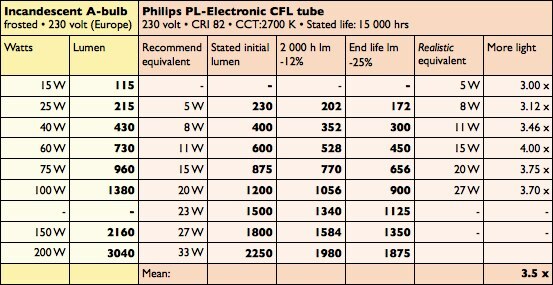 After 2000 hours, the EU Quality Charter accepts a 12% light loss for bare CFL tubes, 17% for covered CFL bulbs, and 25% for both types towards the end of their life. 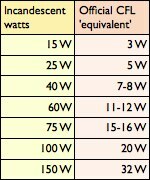 To illustrate how this works out in lumen output for various wattages, I’ve used lumen numbers from manufacturer catalogues [1, 2, 3] for standard incandescent A-bulbs and a typical good quality CFL bare tube at different wattages for comparison. In the following columns I’ve deducted the permitted 12% and light loss after 2000 hours and 25% towards its end of life. Here I’ve deducted the permitted 17% and 25% light loss for double envelope CFL bulbs (a Swedish consumer test showed 15% loss after 2 000 h and 27% light loss after 6 000 h for this particular model). In the manufacturer’s catalogue, it is still sold as “saving 80% light” (= giving “5 times more light” than an incandescent) but as we can see here, it is less than 3½ with light loss included in the calculation. To get the same lumen output as from an incandescent bulb and to compensate for the the poorer light quality and expected reduction in output as the CFL ages, one needs to choose a higher watt CFL than usually recommended – just like professional lighting designers often do when installing new lights, as they are well aware of these factors. This will, however, give a light that may be too bright and glaring in the beginning and too weak and dull towards the end of its life. Thus, an Energy Class A-rated, good quality CFL bare tube does not give 5 times more light, but 3-4. And this is for some of the top brand most effective CFLs on the market, and only using numbers from manufacturer’s own catalogue claims and EU quality charter accepted light loss. As consumer tests keep showing, real output may be even lower, both for quality CFLs (since EU has accepted a lower standard) and even more so for ‘bargain’ lamps. Again, required initial lumen output is slightly less than incandescent output, and light loss and light quality is not taken into account, despite General Electric being more realistic and stating mean lumen values in their online catalogues, which presumably includes eventual light loss. Based on manufacturer figures for initial lumens, with light reduction included, the best tubes give only 3-4 times more light in Europe and around 3 in the U.S.A and Canada (due to incandescent light being more efficient at lower mains voltage). Less for covered, reflector & decorative CFLs, for CFLs used in the wrong luminaires, and for poorer quality CFLs of all types. Consumers therefore need to be advised to choose a higher watt CFL than recommended to get as much light as from the original bulb and to compensate for the eventual light degradation and poorer quality of the CFL replacement. And the EU standardisation directive needs to be adjusted to reflect reality. Update July 2012: Added better and updated graphics. The examples used above may now have been replaced by other models, but according to more recent consumer tests, most CFLs still do not give as much light even initially as the equivalent incandescent lamps did, and all CFLs still become markedly dimmer with age. Now that manufacturers have gotten away with this consumer fraud (because everyone is too lazy to read catalogues and consumer tests) and consumers have gotten used to living in dimmer light, the plan seems to be that faulty equivalence charts are being done away with altogether. Soon we will have to keep (lowered standard) lumen numbers in our heads to know which lamp brightness we want. Read more about the new labels here.